In Murder for Two, playing through this weekend at Playhouse on Park, the laughs come from the improbable situation, exploited as much for its silliness as for its show-biz potential: his own murder as a birthday surprise for Arthur Whitney, a murder novelist, and a cop, with an unseen partner, Lou, who has to play detective among a roomful of suspects. One actor (Trevor Dorner) plays all the suspects, the other (John Grieco) plays the policeman, Marcus Moscowicz. Sent in to vamp by the local police department, Marcus wants to solve the crime before the real detective gets there, hoping to make detective himself. Together and separately, Dorner and Grieco play the piano as both a prop and accompaniment, keeping up vaudevillian repartee and trading off gags. Both actors have experience playing the irrepressible Jerry Lee Lewis in The Million Dollar Quartet and their showmanship at the piano is a great asset of the show here. The set by scenic designer David Lewis is a sprawling room crammed with books and the kind of genteel trappings common in detective novels. An alcove up a few steps from the stage floor will be an ideal spot for certain dramatic and musical moments—not least a somewhat gratuitous film noir death from the creepy backstory of our haunted flatfoot. Anyone willing to show up for the novelist’s birthday has already been used by the voracious writer as material for one of his score-settling fictions. And that means anyone could be guilty of the murder, not least because one of the suspects present, the gruff psychiatrist Dr. Griff, has seen pretty much the entire town professionally—including Marcus—and so apprised the author to the sorts of things the others told in confidence. Why was he so close to Whitney? Well, let Griff enlighten us with a song about the importance of friendship . . .
One of the features of the show that lands best is the notion that everyone present is a kind of performer—whether in the past or in the making—each ready for a big number. It might be ditzy Southern belle Dahlia—who, she says, was forced to give up her successful stage career after marriage—waiting for her showstopper, or her niece, Steph, an eager criminologist in training, wanting to pant musically about being smitten with Marcus. 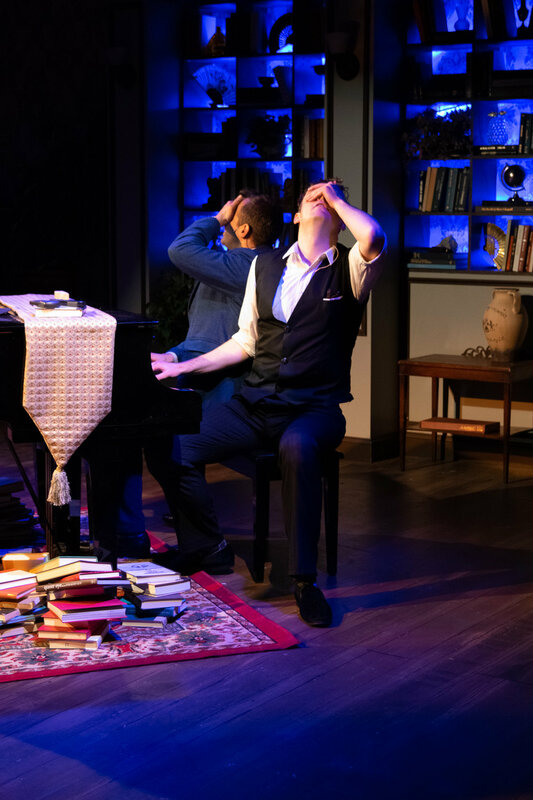 The songs can be witty, are always jaunty, and help to make the most of the whirligig of Dorner’s performance as he launches into one improbable Broadway-style number after another. And there’s good fun with an audience member—as the victim of a second murder—that capitalizes on the close-to-the-action setup of Playhouse on Park. Not all the characters are as keenly drawn as we might hope—a sparring couple are thinly characterized and their put-downs tend to fall flat—and making the aloof ballerina, Ms. Lewis, a love interest for Marcus feels very much a sitcom element. In fact, the Book by Joe Kinosian and Kellen Blair (also music and lyrics respectively)—a Drama Desk nominee in 2014—tends to mix together the tropes of detective fiction, musicals, sitcoms, cartoons, and vaudeville without worrying too much about the whys and wherefores. A good example of the verbal style on show here are the titles of Whitney’s books, which are so literal as to be clues in themselves, almost. The one he was working on at his death, All of Them Bananas, might point easily to the entire cast, including three members of a boys’ choir (whom Dorner enacts on his knees—and then proceeds to Charleston!). Not quite as sharp as 39 Steps, where the Hitchcockian elements help with suspense, nor as inspired as A Gentleman’s Guide to Murder, which won the Drama Desk’s Award for Best Book in 2014, Murder for Two makes the most of its featured players’ talents. Grieco presents a very earnest and unassuming Marcus, his frequent references to detective protocol a good ongoing gag, and Dorner is as manic as necessary, though the introduction of each new character might work better if not off to the side on a thrust stage. Directed by Kyle Metzger, the play isn’t always as slapdash and swift as it needs to be. All in all, every bit of the show is food for whipped-up fun, a kind of murder meringue, without much flavor for thought, so it can’t afford to less us ruminate.